Chandigarh: In its fight against drug menace, the Punjab’s Health department is set to examine the possibility of replacing disposable syringes with the Re-Use Prevention (RUP) syringes which cannot be used again, an official said today. The idea about the RUP syringes came after the Health department apprehended that the recent order issued by several deputy commissioners, banning the sale of syringes without doctors’ prescription, could cause “shortage” of syringes in the market. As a result of which, drug addicts may resort to share the same needle which could increase the risk of the transmission of diseases like HIV and Hepatitis C virus, the official said. “The RUP syringes, once it is used, cannot be reused. Doctors have even told us to make it compulsory. The RUP syringes are currently being used in immunisations programmes in Punjab,” a senior official of the Health department said here. “We will see how many manufactures are there for RUP in the country. We will also see whether the gap between the market price of RUP and disposable syringes is not huge. We do not want any issue of accessibility and affordability. 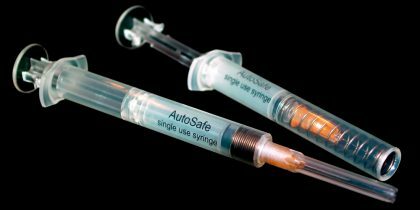 “If the RUP syringes are available at the same rate, then the government can make it compulsory for sale by chemists instead of disposable syringes. We want price of RUP should be reasonable,” the official said. According to the official who quoted a study conducted by the All India Institutes of Medical Sciences (AIIMS) in 2016, there are estimated 75,000 injecting drug users in Punjab, out of which around 12,000 were getting injections from the Punjab Aids Control Society. “Doctors now apprehend if these drug users start sharing used syringes in case of its restricted sale then it could lead to increase in cases of HIV and HCV cases,” he said. The deputy commissioners in several districts had issued orders under Section 144 of the CrPC, imposing a ban on the sale of syringes without doctors prescription. The pharmacists would also maintain record of such patients, the official said. The order came after a spate of deaths were reported from several parts of Punjab because of drug overdose or adulterated heroin. Meanwhile, the Punjab Chemists Association today demanded from the government to put a ban on the sale of syringes through online portals. “There is no check on the sale of syringes through online portals and they are selling at big discounts. The government should take a note of it,” said Association General Secretary Surinder Duggal.